Do you work for Brightspace? Learning about Brightspace? We can help. "Great Features for Interaction, but...."
I like the aspects that are geared to allow for interaction in feedback, announcements, etc. For example, being able to leave a video or audio comment, insert links, pictures and more. I truly believe this helps engage the students and allows for a broad variety of input that are absent in other platforms. In a word; grading. I have worked on 3 other LMS platforms, and have since 2005. Two of the others are lower budget systems. This platform is by far the most time consuming on which to grade. I am not a technology expert but it seems the things that take most time are avoidable, such as having to open a separate window for each individual student for each assignment. On the previous platform for our school there was a page on which the numerical score and detailed feedback could be entered for the entire class all on the same page. Because I work on a spreadsheet to track work reviewed as I log on each day, this made it easy to copy and paste my feedback into the course all at once in an efficient manner. Carefully review the pros and cons. Honestly I do believe it is better for the students which is of concern to most Universities. However, be aware of the additional time commitment for professors. The biggest area would be student engagement. As mentioned above in the comments about what I like, this is what I believe to be truly the most advantageous aspect of Brightspace. "Not as great as competitors. Wish we had not transitioned into this product"
It is great to have all of the features housed in one platform. I really appreciate being able to see if the students have accessed the materials and how many times. Grading is incredibly difficult. You have to go through so much in order to get to a students' work, and click through to the next one. Engrade was a much easier platform to grade papers and written assignments on.I also find the user experience quite challenging and not intuitive. There are a lot of "rabbit trails" one must go down in order to get to the place that they want to get to. See my former comments but I really believe that the user interface is way too complicated and takes too long to get to a specific element on the site. it is trying to cover too much. As a side note, some of my students have mentioned that it is a frustrating color scheme! They too prefer working with blackboard over brightspace. "Brightspace is the best platform for online schooling with their efficient and organized format"
Brightspace is extremely easy to navigate, along with their organized and self explanatory format. I love that Brightspace is very simple and easy to use without any confusing or extravagant layouts. You can personalize your profile with a photo and some brief information about yourself such as your hometown, your LinkedIn profile and any personal interests or hobbies. In my experience, I have had no issues/downsides when using the Brightspace platform. Everything is very well organized and it helps me to be efficient. Brightspace is the most effective online education space and offers many features to it's users. Some of the features available on Brightspace are: A personal profile with option of customizing for added personalization. A "homepage" with access to your courses. A "central hub" at the top of the page that includes Message Alerts, Subscription Alerts, and Update Alerts. A Menu dropdown which includes Announcements, Discussions and Modules. A "Tools" dropdown that includes an automated calendar and an ePortfolio. They also have a "Help" feature for technology help and tutorial videos. Brightspace has so many features to make your life efficient and to make your work effective! The benefits of using Brightspace are immeasurable. It allows me to do my work efficiently and effectively without any issues or technical errors. In my opinion, Brightspace is the best possible platform for the world of digital education because it provides the ability to multitask while also keeping track of work and staying organized. "The best of the available options"
As an instructor or administrator, the drag and drop features are extremely helpful. It makes designing a course much simpler than before. In addition to increased usability, the over all design of the user interface for all levels of user (admin, instructor, student) are almost unparalleled. Before Brightspace, instructional designers had to pay attention to coding and HTML5 to make the content available across all platforms, but with Brightspace, they've done all the work for you. Whether you or a student are on mobile, tablet, or desktop, the content is presented exactly how it was intended. Much like Adobe products, D2L has several iterations of their LMS. With Brightspace, while making it easier to do some things, they've kept the old methods to do the same thing. This has resulted in several redundancies that can be confusing for less experienced users. For designers and trainers, it makes it challenging to teach new users the right strategy and creates inconsistencies. Brightspace is not perfect, so there should be no preconceived notions that it is going to fix poor design skills, poor understanding androgogy or pedagogy, or poor leadership. However, Brightspace has the most well equipped toolbox with a very high level of support to create the right digital environment for nearly anyone's needs. We are using it for our students and teachers! We put our content online to increase student engagement and hopefully increase enrollment as students don’t have to come to campus. It’s more convenient and we can allow students to do more than we can in the classroom. "Brightspace is great for education"
Brightspace is a great organization tool and is a great method of contact as I can receive info through brightspace and also have it redirected to my email. "Fantastic tool for all classrooms"
The website is organized in a way that makes it an accessible and easy-to-use classroom tool for all. A calendar is displayed on the main page for each class, and there is also a calendar available that shows you the schedule of all classes at once. There are some sections that seem unnecessary or repetitive. For example, the assignments and grades tabs seem to show the same things most of the time. Utilize all of its features! There are plenty of ways to communicate with your students and peers, assess understanding, and more. Allows for collaboration and communication between students and professors for all types of classes. Makes it easy for students to access anything they will need for a course, from the syllabus to assignments and grades, all in one place. Communication tabs allow for easy assessment of student understanding and creating connections even in online courses. The D2L Brightspace Learning Environment is up to date and fresh looking. They implement new updates every month. It uses Responsive Design to allow users the same experience when moving from Desktop/Laptop to Tablets to Cell Phones. The system is extremely easy to use and navigate. Great community of users to work with. Great/fast help desk response time. Unbeatable Up time. A lot of the tools in the system have the same features, but you access them from different dropdowns or pages. The system would be much better if all features were accessed the same way. Brightspace is easy to configure and their help desk and community of learners can help you do just about anything you want to do with the system. Creating fun and interactive courses for students. Informing students of the progress in the course. "Great LMS but missing a few key features"
Discussion board forums and topics are easy to set up. You can restrict viewing of threads until after the student has posted their own. Another great feature is the ability to require students to complete modules in order, rather than viewing the entire course at the same time. You can also post due dates which remind students of what is coming up. Quiz results reporting lack some key statistics, including KR-20/21 (reliability) and point biserial for incorrect items. This is important for faculty to understand how reliable the test was, and how to revise individual test items to improve questions. Get to know the platform to see what it can do. Advocate for inclusion of test statistics. We use D2L as our Learning Management System. It is a great way to communicate with students and share course materials in a centralized location. "Easy platform for building online classes & department organizing"
It's relatively easy to use and aesthetically pleasing. The dashboard allows me to see all of my classes, as well as my department's section. Easy to upload documents and organize them. D2L helps professors and students communicate with each other within the software, but it does not allow direct communication between the software and Outlook, which creates miscommunication and confusion among students and faculty. Allow the messaging system to talk directly with outside email. For example, allow Outlook Mail to receive full messages and respond to D2L messages. Or create a link in the alert email that users can click to go directly into D2L to respond to messages. This will eliminate failed responses and increase response rates between students and faculty. Ability to offer 100% online classes that are easily accessible for everyone. 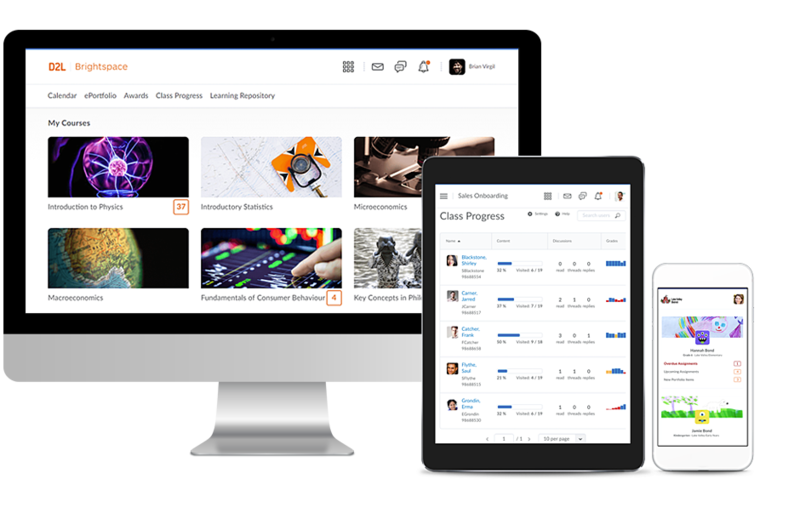 It is a catch-all system, allowing instructors both to assign and grade work and to place lectures and other course material onto an integrated platform. Once you have learned whatever the current iteration of D2L actually is, you're set to go - your focus is on course materials, not learning how to use the LMS that should be facilitating your learning. On the student side, the system is extremely user-friendly; D2L for students is entirely what they make of it. Renovations with D2L cause people to have to relearn their learning management software, which is time that could be better spent actually learning course materials. D2L doesn't change its interface often, but when it does, it's usually a major revamp that requires a lot of retraining or relearning. Additionally, the system isn't entirely user-friendly on the instructor's side, which means that a lot of potential out of the system in its current iteration is often not realized in practice. Be prepared to relearn this system if you intend on using it for an extended period of time. D2L provides a solution to an important education problem: how do you combine course materials, assignment submission, and grading into one platform? That solution is well-integrated. Even as significant training in how to use the LMS may be required, nonetheless D2L meets the needs of both teachers and students, to the benefit of the learning process as a whole. Bright space has been a huge help with the transition back into higher education. What isn’t covered or available during lectures and classes is available to me any time, on any device, as long as there’s an internet connection. User friendly, streamlined, accessible. Some tabs, at times, seem irrelevant. Most material can be categorized between two, maybe three types, rendering excessive tabs and links redundant. Bright space has been a huge help with the transition back into higher education. What isn’t covered or available during lectures and classes is available to me any time, on any device, as long as there’s an internet connection. User friendly, streamlined, accessible. Some tabs, at times, seem irrelevant. Most material can be categorized between two, maybe three types, rendering excessive tabs and links redundant. "D2L keeps my students on their toes!" I've used Blackboard, Moodle, and D2L, but I much prefer D2L. It's easier to use, and it looks cleaner. I really like being able to customize the looks of my classes so that it's easier for me to tell them apart in case I click into the wrong one. (It happens.) I have very few problems with D2L, but if I ever have a question, my university has a whole team that's dedicated to helping faculty with our D2L sites. I feel supported both by D2L and my university. In fact, my university has even offered extensive D2L training as part of an online teaching training program. 6) It would be great if students could download assignment deadline to their iCalendars. I have a few items for my wish list: 1) I would love to have a D2L smartphone app. If there is one, it doesn't come up in my search. It would be even better if it were part of my university's app. 2) I wish that I could set up my "News" announcements so that students would get automatic emails every time I post an update or reminder. I know that they can subscribe, but try getting them to do that! As it is now, I send an email out to my class. Then, I copy and paste the content of the email into a "News" announcement so that it sticks to the homepage of my class. That's double the effort. 3) I loathe accepting late work from my students, but I've been urged to do so. Thus, I have dropboxes set up for the paper assignments, and I have late dropboxes set up for the same assignments as well. I wish I could have both dropboxes linked to the same grade column in the "Grades" area of my D2L site. 4) I wish I could merge files in the "Manage Files" area. Also, I wish I could see what the files are without downloading them. For example, I've uploaded a few creative commons images that have nonsensical file names. Yes, I should've just named them properly before I uploaded them, but it would still be nice to be able to see what items are before I download or delate them. 5) I wish I could create a test bank of questions and that my students could take a quiz that draws randomly from this pool, not just in terms of the order of the questions or the order of the multiple choice answers, but also in terms of the questions themselves. For example, I'd like to create a test bank of 50 questions, and I would my students to take a quiz that would feed them 10 of these questions randomly. I would like the questions to be presented to them in a random order, and I would like the multiple choice answers to be presented to them in random orders as well. In other words, I would like each student's quiz to be unique so that they can't share their answers so easily with each other. Part of the benefit of D2L is that it helps minimize and catch breaches of academic integrity. D2L is only slightly more challenging to use than Facebook and YouTube. It's pretty intuitive, and it's very customizable. Take the time to play around with it. There are so many ways to use this tool to organize course content, make content attractive, and streamline assignments to minimize the impact grading has on our own time. I don't solve "business problems" with D2L Brightspace. I'm an adjunct instructor at a private university. I didn't teach in the days before learning management systems, but I can't imagine teaching without them. Some of the things I love about D2L is having my students submit their papers by a specific deadline. They can't try to tell me that they submitted their paper if it's not in the dropbox. They can't say that they met the deadline if the dropbox is closed either. I also love the interface with Turnitin. What a fantastic tool! Overall, I'm a big fan of D2L. P.S. I didn't realize that D2L was D2L Brightspace. I don't see the "Brightspace" part of the brand when I log in from a computer, but I see that part of the brand when I log in via my smartphone. "Brightspace is the best (well, of the not so great)." Brightspace is fairly intuitive for students, instructors, and admins. Lots of help buttons for when you need it. There are at least three different ways to do everything. Which sounds like a plus, at first, however, when helping faculty it's very easy to confuse someone. Brightspace can be kind of wonky. It uses like it was designed by computer scientists, not instructors. They are definitely on the right track, and while they continuously seek outside feedback and suggestions, sometimes it can be hard to tell if they are actually implemented or just ignored. Also, the help and support features offered by Brightspace are not great, but those offered by various institutions are fantastic. They have a large client base, so you can always find others to help. Working for a university, we absolutely have to have an LMS, and this is by far, the best of all our options and of the ones we have used in the past. Not perfect, but gets the job done. "Brightspace has come a long way and has a lot of great features"
I love Brightspace's interface with Turnitin, especially since I teach academic writing which is an area where it's particularly hard for students to learn to write in their own words. This makes Turnitin a great tool that's easy for them to access. I also love the huge amount of control I can have over the organization, open/close dates, and other factors. Although Brightspace has really improved a lot, it's still a little unwieldy, especially if it's your first time setting it up. Luckily, my university offers outstanding online and in-person instruction for instructors who want to use all of Brightspace's potential, but there's really very little out there from the platform itself (like there is for Blackboard and other LMS solutions). This is an excellent LMS that's increasingly user-friendly and allows for enormous control and customization on the part of instructors. I use this LMS for teaching an all-online Academic English class for international graduate students. The organization and online capabilities have really helped me facilitate this online class where I don't have as many opportunities to interact with students face-to-face. "Full featured LMS with good usability"
Many available features. Works well for my fully online courses and as support for in-person classes. Good automation of many tasks (like reminder emails). Integrates with my online homework solution (from Sapling Learning) and other external features. Some interface quirks require getting used to. Actions are sometimes "hidden" in a small arrow icon. Once I learned the general layout it has been fairly easy to use. Most users will need some training to learn the features, but after getting up to speed should be useable by most. The main solution/benefit is a central, easy to navigate space to provide content for students and keep track of progress and grades. Students generally find it easy to use. "Full Featured but Very Limiting"
D2L Brightspace is now responsive so that it looks much better on Desktop, Mobile, and Tablet. For the most part the modules (Content, News, Quizzes) make sense to the end users of the training. Discussion Forum and Topic features are robust. If you don't do things the D2L Brightspace way, it can be a real pain. That is, if you don't use the tools the way the developers expect them to be used, you usually end up having a problem with the training modules. It's difficult to have robust critique of peer work in Discussions, and good grading tools, and good file collection in Dropbox without the end users having to visit all three modules and figure out how they work together. That is, unless you're just dealing with text or Word files, the features are limiting. Rubrics are a pain to implements because of competency features. You can't have a mixed holistic and analytic rubric. Getting your content back out of rubrics or quizzes modules can be a fight. Sometimes you're just better off posting PDFs of that type of content rather than trying to decode what the developer expected you to do while using the product. "Simply the best nowadays upcoming LMS"
As simple as Facebook to use If you are a student. As easy to administrate as a Wordpress site. Some customization options are not smooth but I'm sure they will get better soon. Nowadays, it's complicated to deploy a multi-site environment without a little coding help. D2L knows these issues and they're working hard to solve it asap. You will find really easy to adapt BS to your needs and your users will rapidly join in. It has several integrations with external tools already running and setting up a new one is not a pain. With a very powerful documented API and working services, anything can be plugged in. Vendors are serious about the SLA's and uptime. The flavour of the system is completely 2017-ish, far away from the java-application-like feeling of the usual LMSs. Being the new guy in town is not a deal for D2L, it performs very well. It also has a pack of apps for students and teachers that makes 100% possible not to touch a desktop computer to manage or consume the system. As a custom approach, I would say that If Blackboard is a Mercedes and Moodle is a Chevrolet, D2L would be a Tesla. 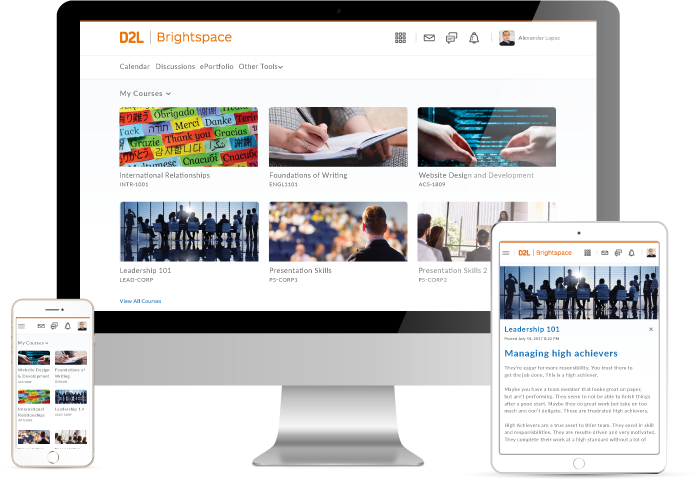 D2L Brightspace is an affordable, fast, cloud and simple LMS perfect for little educational needs, but escalates very quickly for huge scenarios. As a consultant, Brightspace would be the first choice for most of our clients, no matter if they're looking for their first LMS or they want to move from their current one. It haves a conversion tool that can turn Moodle, Blackboard and others' courses into D2L format with a few clicks! The best part about the D2L Brightspace LMS platform is that the company is always adding innovative new tools. The product has come a long way since I first started using it over ten years ago. There needs to be more security features within the quizzing area. Currently the "best option" to provide a more secure testing environment is to purchase a 3rd party addon piece of software called "Respondus Lockdown Browser". The Lockdown Browser, in my opinion and experience, is an overly priced and bug ridden headache that causes problems for not only students but faculty and tech support. Try using the software and you will find its generally much better than the other LMS platforms. You can also customize it as much or as little as you like and overall the most users find it very intuitive and easy to use. This questions doest really pertain to my field of experience using Brightspace (Higher Education). Brightspace, Desire2Learn's learning management system, is great! I love the simple interface and the ease of use. Whether you are a new user or someone who wants to create a complex course online, Brightspace will work! Because this platform was initially built a while ago, some of the features are a bit dated and do not integrate well with the rest of the system. For the most part, these are functions that are not widely used (attendance, seating charts, etc.) but every now and then there are users who ask about them. Definitely worth paying extra for the TAM - better support. It is the primary learning management system for our university. It has a phenomenal online format when going through iPhone. It has a clean and simple look to it, but still allows for personalization with photos. It is user friendly and you receive announcements like any other social media notification. Check boxes to see what is complete and not complete/reviewed. It can be slow and show up odd depending on what browser you use to open bright space. It can also be a bit irritating that downloading something does not "check the box," but that you still have to click on the link to have it complete. Give it some time. Once you figure out the techniques, it is quite a helpful tool. Business problems solved include ability to communicate between multiple constituents on the same platform and with speed. Benefits are ability to create and submit assignments. "Bright space easy to follow and interactive "
I like best that it is extremely easy to use and easy to learn. I don't like how sometimes it does break down quickly and requires maintenance. For educational purposes, I definitely recommend other Universities to use Brightspace as it is really easy to lear, easy to understand, and easy to communicate through. I find it extremely easy to receive grades and other feedback through bright space and highly recommend it to other Universities. My entire university uses bright space and it is helping maintain consistency and is great for learning. D2L's Brightspace is a very user-friendly, and interactive Learning Management Platform. I enjoy the built in HTML Editor, as well as the built in content templates. Additionally, you are able to create rubrics to easily evaluate activities based on a predefined set of criteria. The customer service is not ideal. If you require support with an issue, they make you sign a "ticket" and THEY will rate your priority from high to low on how important they make this it is. Often takes weeks for them to fix issues. Furthermore, you cannot put accents on people's names when adding them to the LMS - which is not great when you work in a bilingual association and several of your student's have accents in their names! it is a way better host-site for our content then the previous company we used. I've received good feedback, however there are still many glitches that need to be solved behind the scenes. "D2L - Brightspace LMS "
When we started using Brightspace, it was still called D2L. I liked the simplicity of the name; however, this is not a simplistic product. I worked on both the admin and the user side; however, I will discuss only the teacher/student user side on this review. When logging into the system, there are several options for the landing. Our district chose to have a district landing page. The widgets were easy to navigate if set up correctly. When moving into a course, the user would land on the homepage of the course where another set of widgets were available. This providing an area for students to gain important information and navigate to additional links. I also liked the drag and drop feature to add content. This made content curation easy. The biggest challenge for this product is the navigation for the user experience. Students and teachers would have to click multiple times to access content. In addition, the process for organizing and presenting content was sometimes difficult if you didn't know what level you were on when modules, sub-modules, and even additional sub-modules were created. Providing an LMS for integrated teaching and learning for a K-12 school district. "Graduate student utilizing bright space for doctoral degree. " The way subjects are categorized is intuitive. Items under the communication tab are items you would expect to find under communication, the same can be said for resources, etc. Recently brightspace was updated, and it has become entirely too bright. Organization of tabs and pages do not make sense. It would make much more sense to have things in a grid format rather than a list. I utilize brightspace as a student, and I have found it provides convenient ways to communicate with classmates via discussion boards. It is also easy to download course material. 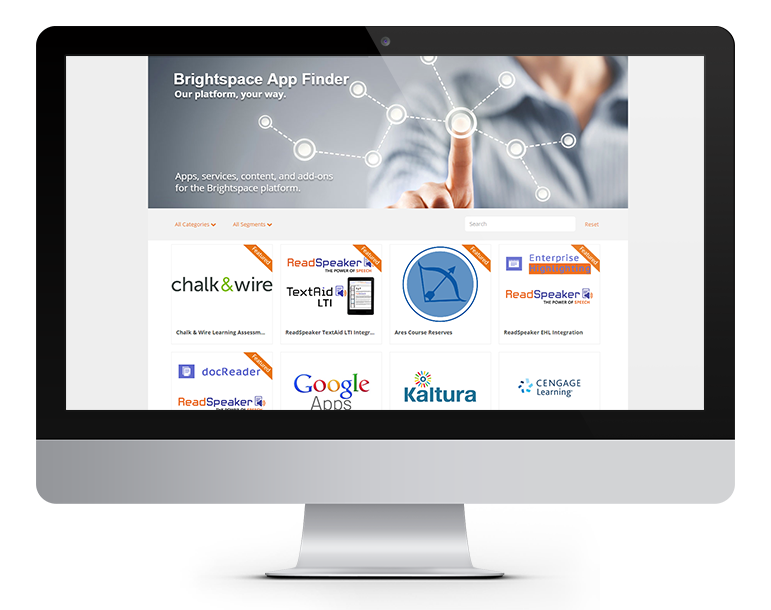 Brightspace is an attractive interface with intuitive features that are easy to use. Brightspace also allows organizations to integrate the use of other educational learning management systems (i.e. MindEdge) for a more complete online learning experience. Some of the grading processes require the user to open multiple tabs or to toggle between different screens just to grade one assignment type. I recommend Brightspace. It seems to be the newer, more up-and-coming LMS for educational institutions. Brightspace offers the flexibility and convenience of online education. The part I like best about Brightspace is the Gradebook, you can easily set up assignments that will auto-grade and post grades directly into each student's gradebook. The only part I don't like is that some of the formatting is rather fixed in nature and I would prefer more modifcation options. Business problems include teaching online students without meeting face to face in classes. The benefits have been improved class organization, accurate grading, and good communication with students. I love all of the features that are available on BrightSpace. My school switched from another LMS about a year ago, and I like BS much more. I cannot think of anything that I do not like about BS as a program. However, I think that the way that particular schools set up their LMS could improve. The school I attend and the school I work at have it set up different, and the school I work at is not utilizing some of the features I use as a student. BrightSpace gives students many more options than our old LMS. "D2L Brightspace is the forum for students who take virtual classes/classes with an online component"
It's fairly simple and self explanatory when seen as a student. You can see your classes that you are in and once in your class you can see your discussion boards, quizzes, grades, etc. whatever the professor has open for you to see. When viewed as a professor or when creating quizzes, it can be a little cumbersome, a lot of little nit-picking ways that you have to do things. Play with it, see all of the tools it makes available to you and utilize them. It's great for online classes, online class management. It gives you the opportunity to use all of the tools that make up an entirely virtual class. It's also great to supplement a regular classroom experience, for example, if you'd like your students to do a test or quiz at home, you can sent one up. "It’s a pretty intuitive platform. " I enjoy the mobile version’s “swipe to reveal” function. I have found that in the app some files were unfindable; I had to use the web version to see everything. It’s a great place for group discussion and enables me to see all of the content for my classes in a single place. "I have a mixed experience with D2L. It's sometimes easy to navigate and other times frustrating. " Navigation in D2L is mostly easy and that is what I like about it. My institution's D2L is setup so you can easily see all "my courses" once you go past the single sign-on page. You're able to see notifications, important dates including events scheduled in a calendar, which makes it easier to see a lot of things just at a glance. And once you're in a specific course, you can navigate and access checklists, grade-book, quizzes, class-lists, course content and so forth within few minutes. All these make it easier to use D2L and I like it. Firstly, grading quizzes using rubric never worked for me until very recently. Even though it now possible to grade using rubrics, there are still technical difficulties. For instance, grading from either "Spreadsheet" or "Standard" Views do not seem to be the same. Regardless, of the "view", when you grade with rubrics, you still have to manually input the grades into the spaces provided for grades (in other words grades do not get imported from the rubrics) and that is frustrating and time wasting. Moreover, it is very difficult to find all the discussion posts (threads and replies) of a particular student without having to go into the "Edit Course" and following other procedures. Finally, when importing for instance a test-bank into D2L, some characters tend to be configured differently, like a simple multiplication signs, arrows and so forth. I hope these issues can be addressed. It saves time to give quizzes and auto grade them, allow effective communications such as instructor-learner as well as learner-learner interactions etc using an online learning management system that replicates face-to-face classes....without having to spend too much money and I believe that is why D2L comes in. And to some extent, D2L has been helpful in those categories. "D2L is a little unwieldy. " The system provides an online space in which I can post scores, allowing students to track their own project. I would probably consider using Blackboard over D2L Brightspace, unless they can implement a system that is a little more user friendly or, in the least, offers more grading options. I am an educator. The benefit here is that students can see their assignment grades. "D2L Platform for online teaching"
Easy to set up template; tabs for most used topics;News for announcements at homepage;ability to "ping" a student who is online for a quick chat. Great way to have grades and feedback readily available for students in FERPA compliant venue. Dropbox works great. Not easy to update dates for cloned classes (quarter after quarter). Should be more streamlined imo. Fill in the blank quizzes are a real pain to grade! There should be a fuzzy algorithm to allow more accurate assessment by computer. Case sensitive isn't enough. The answer re-bar, rebar, and rebar. should all be the same. I can't type every permutation and students are put off when they are graded "incorrect" for an answer. Even if I override the grade, it still shows as a red X incorrect. This version is much better than when I started with it in 2012. "Way better than WebCT, but still not as advanced as it should be"
+ Dropbox receipts. You always know if the Dropbox accepted your submission or not, because you get a receipt/notification in your D2L. + Email forwarding. All of the emails and notifications I get through D2L are forwarded to my Gmail account, so I have an easy way to monitor what's going on in my course. You can't respond to these emails or messages from Gmail, though. + Discussion space has improved a lot over the years. The discussion space seems to be getting better and better, and it's definitely better than most other online learning spaces. It still needs to improve in letting users mass select discussion posts, edit previous posts, and organize discussion posts. - Difficult to use on a mobile device. D2L is really behind when it comes to optimizing their site for mobile. The mobile-friendly site is useless and I always immediately just go to the full desktop version and zoom/scroll my way around. The Brightspace app is also not useful to students. - D2L mail pretty much is the worst. D2L mail is really hard to use on desktop and nearly impossible to use on mobile. You can forward your emails but you cannot respond without going into the D2L website. - Discussions need more improvement. It takes me almost an hour every week just to sort through all the discussion posts and do my required responses. Not because they take so long to read, but because "clearing" all of the discussions takes so much time and effort for the user. It takes multiple clicks over and over again to clear all of the discussion post notifications from my profile. You also can't go back and edit any of your discussion posts, so good luck if you make a spelling error or forget the attachment. If you're currently using a program like WebCT, definitely switch. It's way better for students. Still not a great product, in my opinion, but way better than many other options that are out there. I use D2L for my master's classes. The benefit is that I get to take online classes from a public university. I have also used D2L from a student-admin role when I taught Psychology 101 as a professor's assistant. "Former system admin, using it for thesis"
The interface is highly intuitive. Instructors can produce courses with little training. There are very well produced instructional videos. Only one version is live at any time, therefore there is uniformity. I don't really have any dislikes of D2L. Get in touch with their sales team or sign up for their demo. It's a very easy to use LMS compared to a lot of the rest on the market. I am currently using it for producing my Ed.M thesis, but I have used it as an LMS in a nursing school. Students and faculty found it easy to use. "I have taken many online classes through D2L"
I like that information for the entire class is set out clearly and very accessible. Assignments are easy to find, quizzes are graded immediately, and the dropbox is a very useful component. I do not care for the email system. It does not retain the list of addresses and is not intuitive. I also wish that previous classes could still be accessed for information that was used and maybe relevant to use again, for example an online class for Photoshop that had links. I was in the graphic design program, being a self-taught freelance artist, and wanted to initially further my skill sets. I then hired on at PCC and utilized learning as much as I could while at work. Online classes were the only classes I could take. "Great LMS that keeps making advances"
Entering grades can be difficult at times. Setting up integrations can be harder than expected. "A strong LMS that makes it easy for the user harder for the IT dept"
I love that Brightspace has a lot to offer. The ease of view for the student and using it on a non-administrative side allow for a smooth experience. You can easily integrate other products like you SIS, textbooks, or use their analytics to help provide a better experience for students and classes. Ensure you have a long time to implement depending on your size. Test many packages of courses. The best part are the analytics and the power it hold. The short interactive tutorial available to faculty and students. The way the rubrics are now in the dicussion boards. I like that they are in there, but it seems big and cluncky. There tools can be used for so much more if you just think outside of the box. I am able to share the links to the tutorials with my faculty members so they can learn how to complete a task as well as teaching them how to fish. What I mean is that I keep sending them to Brightspace for the answers they rely on me for, and now they just cut me out of the loop and go directly to Brightspace. This makes everyone more productive and self-sufficient. D2L allows instructors and students a gateway to their class materials. It integrates seamlessly into online content and allows for tracking and updates over the course of different semesters. As an educator it is straightforward and easy to create online tests and quizzes and performs great under the high strain of large class sizes. Some of the functionality can be challenging to read or view on the site, requiring it to be opened in another browser window or downloaded. Don't go it alone! On call support is there as this product becomes an industry standard! Grades are posted and calculated immediately allowing for instant gratification. This is a wonderful product with very few drawbacks considering the wide number of files and functions it displays. D2L is like Blackboard used to be - responsive to customers, customization, and user-friendly. It's like Moodle, but turn-key so it works and is rock-solid. I wish it was a bit better at grouping users into cohorts that could be added and removed from courses and eventually deactivated automatically. Hosing online courses. It's been great, better than Moodle and just as good but cheaper than BlackBoard. It's easy to use on the student-end and has pretty good tools for the admin to manage courses and students. "Very helpful, but could be more user-friendly"
There isn't another platform that I know of that really competes with how Brightspace is used in universities. They offer most of the tools needed to run a course online, and new tools are always being added. I also love the gradebook feature. 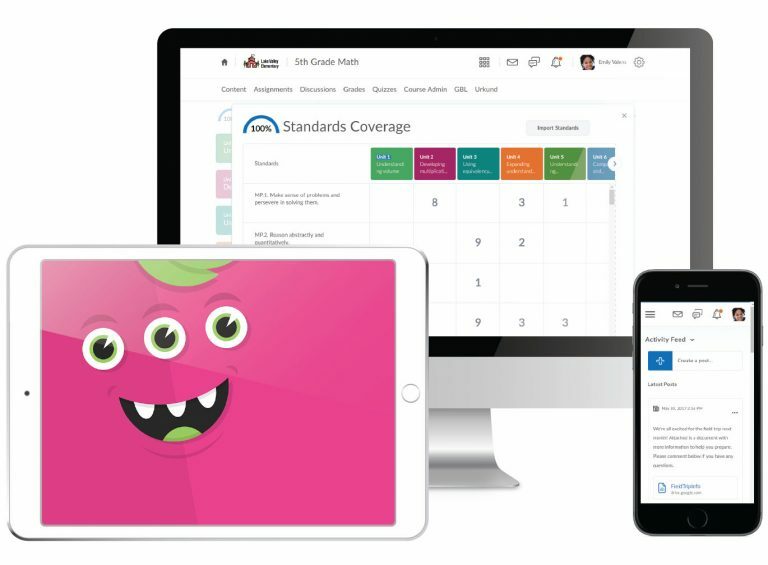 It allows me to keep all of my grades organized in one place, let my students see their grades, and it even calculates grade totals for me based on my settings. By nature, the way D2L is set up for my university is not extremely engaging. It looks like a program developed by coders with few graphic designers involved. This causes students to sometimes see it as "boring school" instead of an innovative environment. I have also seen other platforms for business that encourage collaboration more, which I would like to see done in D2L. It is also not very user-friendly for teachers or students. I have had several students be unsure of how to accomplish something in D2L, and there have been several things that I have to do as a teacher that are more complex than they should be. Another thing that could be improved is that Brightspace and D2L could be more clear about what features are available. I am always learning about features that I would have used earlier had I known they existed. If you are using D2L, dig into Brightspace's resources as well as resources posted by your own workplace or other workplaces about D2L. Each university's version may be slightly different, but sometimes you can understand the process you need to take by looking at another university's tips on D2L usage. I use D2L to give my students information and resources that I can't give them in class. It also helps me because it is connected to Turnitin, so I can have my students papers automatically checked for plagiarism. It is great being able to have students turn papers in on D2L to have a backup copy of all of their major papers in case anything gets lost, stolen, etc. It's also great that students can take quizzes that involve them listening to audio to answer the questions. As a music teacher, this is extremely beneficial.